We have just released POPREP 7 the latest version of our popular Email Consolidation MRA and forwarding MDA Software. In version 7 we have added support for retieving emails from EWS - Exchange Web Services in addition to; OWA Outlook Web Access and POP/POP3 email. You can use and evaluate the full unrestricted version for 30 days at no cost. It can be used on any Windows® Version XP, 2003, 2008, Vista®, 7, 8, 2012. Licenced versions of PopRep starts from as little as £5(+VAT) - approx US $8. To purchase, go the products page for more information read more here. The updated version of Twistrounds POP, EWS and OWA Email forwarding service is now available for Download and Purchase. 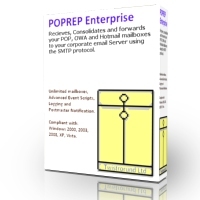 * Poprep has been a wonderfully stable product to help with my e-mail needs. It has toiled for 8 months with no errors. * Poprep is great, it's been running on one of our servers for tree years without a single glitch, we even forgot it was running as we have had no problems with it. It just works!